Eyelet is a classic summer fabric that is breezy, romantic, and delicate. Its name comes from the small patterned cut-outs that are typically finished with embroidered stitches throughout the body of the fabric. Eyelet is a broad term and describes the design of the fabric rather than its fiber content or weave. Traditionally, eyelet is made from a woven base fabric, in a white or cream color. It is usually made from cotton or linen, although jersey, silks, and even leather can sport eyelets. Ella Daisy Eyelet , 100% cotton, embroidered floral eyelet from Harts Fabric. Bright Orange Show Stopper! , 100% cotton, embroidered eyelet from Mood Fabrics. Elle Eyelet , 100% cotton, modern triangular cutwork pattern with embroidered scalloped selvedges from Stone Mountain and Daughters Fabrics. Summer is a perfect time to sew up eyelet fabric—it’s got a natural “air-conditioning” and can add a bit of class to even a simple running errands outfit. Although there is an endless variety of eyelet fabric out there, today we will concentrate on the most common iteration of eyelet—the traditional, light weight, cotton eyelet. This fabric is sometimes slightly transparent, and has a crisp feel while keeping nice and drapey. Machine wash cotton and linen eyelet in warm water with like colors on regular cycle, tumble dry. Press on wrong side, when possible, to avoid flattening any embroidery. Typically, the thread used to embroider the eyelets is synthetic, test your fabric before and use a press cloth if the embroidery is indeed synthetic. Trace your pattern onto tissue or Swedish tracing paper, the slight transparency of this paper will help you avoid ill-placed design motifs. Depending on the eyelet design, the selvage of an eyelet may have a lovely lace border that can be incorporated into your garment design. 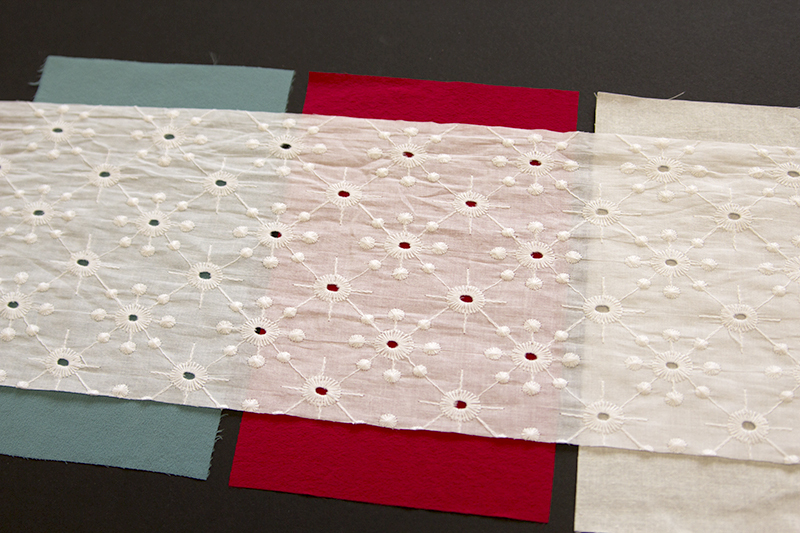 For cutting and pattern arranging advice, check out Sarai’s tips for using eyelet borders. Tailor’s tacks are preferred due to the texture of eyelet. Chalk may become embedded in the embroidery. Underlining works best for eyelet fabrics. The peek-a-boo of the eyelets give you a great opportunity to add a little pop of contrast. If modesty is what you’re after, underline your eyelet in in a fabric close to your skin tone. For tips on underlining, check out Brooks Ann Camper’s Under Construction article in Seamwork 12. Do not use fusible interfacing directly on eyelet fabrics, instead use fusibles on your underlinings. If you decide to not underline, use a silk organza that is the least visible. Thread is dependent on fiber content and weave rather than design. If you are sewing up a garment in the traditional cotton or linen eyelet, use cotton or polyester thread. Due to the little windows all over your fabric, your seam will most likely be seen through your garment. Tidy seam finishes such as a hong-kong finish, french seams, and serged edges will look best. Turned up hem, serger rolled hem, and double turned baby hems on blouses. For a heavily embroidered eyelet fabric, a wider (1″) single fold hem will work wonders and will keep the hem from hanging too heavy. Summerwear! 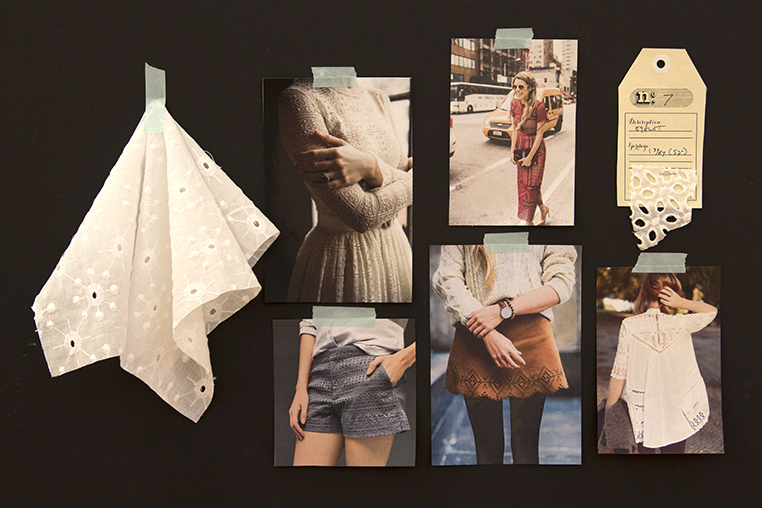 Dresses, skirts, even shorts are beautiful and breezy in eyelet fabrics. Design details may get lost in the texture of the eyelet, simple silhouettes and construction will allow eyelet fabric to be the star of the show! Picking the right pattern for your fabric can sometimes be daunting. 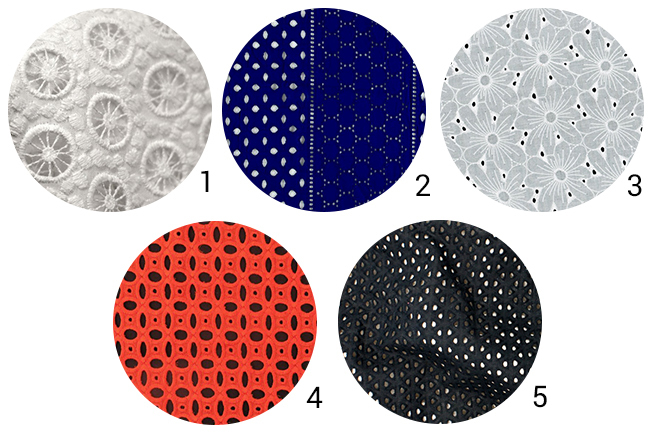 Thankfully, we’ve selected a few of our own patterns that are ideal for eyelet fabrics. They all are relatively simple garments which pair nicely with the classic look of eyelet while not overpowering the motifs. While sewing them up, we even learned a couple more tricks specific to the patterns. The pleats of the Zinnia give the eyelet a bit of structure while also giving the skirt some delightful fullness. Lining the Zinnia is a breeze—try a free flowing contrast lining for a bit of fun! This knit skirt is quick, easy, and is a perfect introduction to sewing knit eyelet. You’ll defiantly want to underline this bad boy. If not, the serger edges of the lining and outer shell may be exposed. Knit eyelet is a bit harder to find but Wallis found her seafoam green knit eyelet on Ebay. This simple dress gives you plenty of opportunities to play with your eyelet and get creative. Anna decided to just line her skirt and center front panel, giving the side panels a little bit of peek-a-boo. Sarai’s Embroidered Hazel was sewn up with the intricate borders of her fabric in mind. She placed the border at the neckline as well as the hem. This same technique could be used in an eyelet for an even more delicate look. The simple lines of the Kenedy lend itself well to a more textured eyelet. Haley kept her Kenedy unlined in order to wear different colored slips underneath to change the look of the dress. She also chose to bind the neckline for a cleaner finish. Want to try your hand at some of this summery goodness? Learn more about our Eyelet Collection in the Colette Shop. I made a shirt for my daughter using an eyelet fabric from Hancock’s fabrics and I broke one needle! Every time the needle passed through a heavy embroidered part of the fabric the sewing machine struggled. Be careful! Hi, I love eyelet fabrics. This Zinnia skirt version is great. Last summer I made the sorbetto top in eyelet cotton and I love it so much. Perfect for the hot season. I love your eyelet sorbetto!! I’ve thinking about making a shirt dress with eyelet fabric, but that Zinnia skirt looks like a winner as well. Thank you for writing this post. Wow, I would never have considered eyelet fabric since my thinking is that it is very “child-like” but that black mod version is very tempting….. I make cotton slips from eyelet fabric-also bathing suit covers too! I saw an amazing eyelet dress at Ann Taylor the other day; I took pictures of it so I could figure out a way to replicate it. It was the exact orange of the fabric swatch you featured. Now I just have to find a cotton lawn in the same color to go underneath. Love it! That is so great! I’d love to see your finished dress. All these tips for sewing with eyelet will come in handy, whatever I end up doing with the eyelet. In fact, I think I’ll print them out and put them with the fabric. The dahlia would be fantastic! The little bit of gathering in the skirt will lend itself well to the drape of cotton eyelet. You could also keep the sleeves unlined, which would could be really pretty. I would have thought the Hawthorn dress pattern would have been at the top of the list for eyelet fabric…. That would be beautiful! The gals didn’t decide to make the Hawthorn but by no means does that mean that it wouldn’t turn out great. It’s absolutely on my list! Lovely all around! I found an interesting knit eyelet for Hayden that’s slightly textured and quite stable, so I’m hoping it will work as a modification instead of a woven fabric. Now I think I’ll jump in! Thanks all for the inspiration. I made a Hawthorn in eyelet, and it turned out beautifully (though I’ve now lost weight, so it’s oversized). Would you have and suggestions for a none-stretch mini, similar to the Mabel? I purchased some lovely eyelet four years ago at Gray Line linens in NYC thinking I could make curtains, but I wanted something that would let more light in. If your looking for a mini skirt pattern, I love the Nascha Mini Skirt by Named Clothing. How did you use the scallop of the hem on zinnia? Zinnia is a curved hem. Did you redraft the pattern to make a straight skirt hem? I ask because I am besotted with Sarai’s skirt and I’m totally making one! It’s so easy! I used two different eyelets. The main one has smaller holes, and the one on the bottom had larger holes and the scalloped border. All I did was shorten the skirt by quite a bit (I think it was 10 inches). Then I cut a 10 inch wide strip of the border off the other fabric. I sewed that border to the bottom of the shortened skirt, like a trim. I lined the top part of the skirt, but not the bottom trim. Super easy modification.